Folks, junior lithium stocks are not in vogue right now, but I felt I had to go on Standard Lithium’s (SLL-TSX, STLHF-OTC) property tour this week in the small town of El Dorado Arkansas, just north of the Louisiana border. It’s because I think they have something VERY special, and I think they are on the cusp of being able to prove that to the Market (and of course I’m hoping that makes a big difference in their share price). This investment will probably take a big longer to mature than what I like, but I want you to think about Mitchell Energy, built and sold by shale oil pioneer George Mitchell to Devon Energy for $3.1 billion in 2001. George put hydraulic fracturing together with horizontal drilling and unlocked an entirely new source for oil. It was a global game changer. He gave the world Shale Oil. It revolutionized oil production, upset the balance of oil power in the world, prevented $200/barrel oil and created prosperity for tens of thousands of investors and workers alike. FAST – only takes 1 hour to remove lithium, and they can re-inject the brine back down into the formation in four hours. Folks, those big brines up in the Atacama are in evaporation ponds that take 18 months to concentrate before going to a lithium refinery. 18 months to 1 hour. Scouts’ Honor. This is a win-win-win-ad-infinitum development. The only way it’s not is if Standard Lithium gets taken out too early by Lanxess or some other big chemical company. If you leave this story remembering one thing, think SLL lithium = cheap, clean and very very fast. And now they have a BIG partner to commercialize it all. This is still early days for Standard Lithium investors, and that will mean a bit of patience. But Robinson and his team of chemical engineering PhDs do have a process that works – extracts very high recoveries of lithium – at bench and pilot scale. SLL recently bought the entire rights to the process from the consulting scientist on the team who provided the breakthrough. (primarily trades in Germany, USD$6 billion market cap, 74 chemical plants and 19000 employees) to install a lithium module onto one of their bromine plants in southern Arkansas. 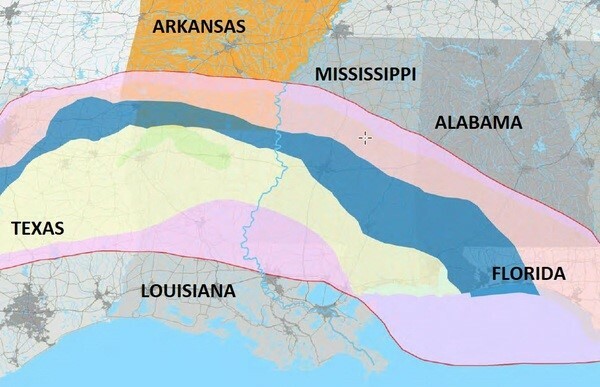 In 2017, Lanxess paid $2.7 billion for the three bromine plants in that area, and each taps into the humungous Smackover Formation, an underground water aquifer that stretches from Florida in the east to Texas in the west, and northern Louisiana and a big chunk of Arkansas. In total, they pull up and put down about 500,000 barrels or more than 21 million gallons/80 million litres of brine a day from the Smackover, and extract the bromine from it. Bromine is mostly used as a flame retardant and to purify water, but has many uses. Standard Lithium has developed and is now patenting a process to extract the lithium from that same hot brine. They cut a deal with Lanxess to run the residual brine – after the bromine has been extracted – through a specially built lithium-extraction module on their grounds. That’s what we went to see on this property tour – the Lanxess bromine plant. These are massive operations, but for SLL itself, I have to tell you, we didn’t really see much – in fact you could argue we didn’t see anything, except a flat piece of ground inside the permitted area of Lanxess operations where the pilot plant will go. Yep, I took 3 days off to see a patch of grass. The value in the trip was meeting Lanxess officials. We were able to see how they interacted with Mintak & Robinson (M&R), ask them questions about the logistics around and their commitment to the project, meet the SLL site manager etc. And get a sense of how much money they would need when to make all this happen. Let me back up for a minute. It’s true that junior lithium stocks are not “hot” now, but fundamentally the lithium business is still quite profitable, and nobody is disputing the need to find and develop more lithium for the fast-growing EV market. In economics, costs to produce lithium are ranging from roughly $3500 per tonne to $8000 per tonne for and sells anywhere from $11,000 – $14,000 per tonne now. In 2017 it got as high as $25,000 per tonne in China. In geology & production, most lithium either comes from huge ponds – and I mean km’s x km’s in area – up in the remote Atacama desert at 14,000 feet elevation on the Chilean/Argentine border, or from hardrock mining (the minerals are called spodumene or lepidolite) in Africa and Australia. Most lithium mines are quite old, and the geologists and engineers who put them into production have retired. The majors in the industry – Albemarle (ALB-NYSE) and SQM(SQM-NYSE) out of Chile – keep saying they will have enough supply to fill demand for years, but most people are very skeptical of that. A new junior producer, Orocobre (ORL-TSX) has had a very difficult time getting their new brine ponds to perform to what they hoped up in Argentina. Lithium Americas (LAC-TSX) is also trying to put a new asset into production in Argentina. And there’s a new hardrock deposit in Quebec by Nemaska (NMX-TSX). The point is, it’s all more of the same. AND the majors are having big public squabbles with the Chilean government over water, and having to deal with massive currency devaluation in Argentina. Standard Lithium and Lanxess have the potential to quickly – within 3-4 years – develop a massive new supply of lithium in the USA in an area with abundant skilled labour – I mean, the local colleges around El Dorado offer courses in the technical and managerial aspects of bromine extraction. You could not have asked God to put this massive lithium resource in a better place. It’s worth understanding how Standard got the Lanxess deal. 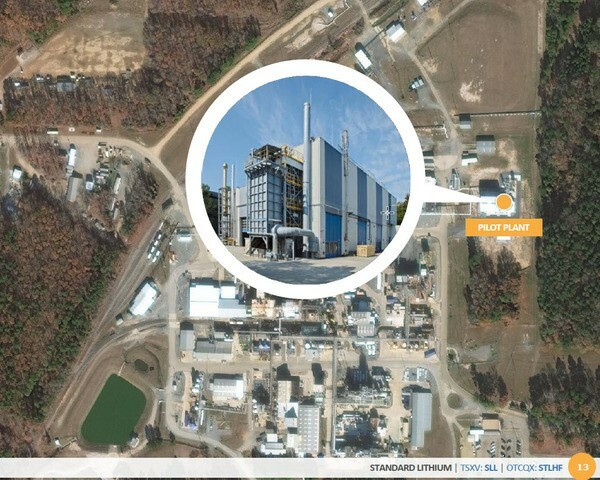 When M&R identified the Smackover as a great potential source of lithium-rich brine, they spoke to a company called Chemtura in 2017, who owned the bromine plants then. Chemtura was quite open to the idea of running a lithium module after their bromine extraction, and M&R moved things along quickly. Chemtura had no interest in lithium and was happy with a passive royalty or toll charge. But then Lanxess bought them out as M&R were talking to them. Lanxess is a BIG company, and their German thoroughness showed through immediately. Talks slowed, but Lanxess did their homework. They hired outside consultants to educate them about lithium, and after studying the market, agreed to a joint venture and pilot plant. Now that sounds like it was easy, but I want you to think about what that really means. It means a multi-billion-dollar chemical conglomerate with thousands of employees believes that SLL’s process can move the needle for them. At the site visit, the incoming site manager – flown in from Germany to live here in rural Arkansas (El Dorado is 18,000 people) said the southern Arkansas assets represent about one eighth of the full company now – that would be US$1 billion. So it’s a meaningful chunk. This big company believes SLL’s process – assuming it works at scale like M&R say it can – can be installed at all three plants over time. It all really does make sense – this is a great new revenue stream for Lanxess out of an existing asset, but you never know what the internal politics & incentives are at these big companies. Lithium grades are in the 150-500 ppm range, which is great economics especially on the kind of huge scale Lanxess could build here. In fact, they can now go back to areas that they have produced out, i.e. exhausted the local bromine in a part of the Smackover, and now go back in and get lithium revenues from it. I’ll bet a steak dinner they discovered that lithium will be a lot more profitable than bromine. And they get a risk-free, exclusive front row seat as SLL proves out their process at scale. But a commitment to an entirely new product for Lanxess is a big deal. The lithium extraction is complementary, and handling lithium is much safer and simpler than bromine, so there is no Health & Safety issues. And M&R really believe they will be at the bottom (toe) of the cost curve, setting a new bar for the industry worldwide. Plus there is a very long runway here… EVs are expected to take over from ICE (Internal Combustion Engines) over time. There could be a 50-100 year runway here, and this is like investing in Henry Ford’s first Model-T shop. Again, Lanxess’s decision makes sense – but appreciate that this had to get sign off from the top in Germany. Lanxess would not have made this decision without speaking to the senior management of the big German automakers – NO WAY. When you think of the weight and gravity behind their decision, this is A BIG DEAL for them – and for Standard Lithium. I would caution the Lanxess deal that’s in the public domain is still very nebulous, with language like… “remain subject to completion of due diligence.” But certainly on site, they were vocal and keen to see this pilot plant built ASAP and move forward. My understanding is that SLL has to fund and build the pilot plant, but Lanxess will foot the bill for the entire construction cost of the first commercial facility, and SLL will get a profit share out of that. But again, the final version of the contract hasn’t been done. SLL must raise several million dollars to get them through to where Lanxess takes over the capex; at least US$10 million and likely more. What I like is that this team has built something so quickly – the company is only two years old, and they have a new, clean, cheap and fast process and a big partner and a colossal brine source… they have done everything from both a technical/geologic/engineering point of view and business point of view. Very few junior teams do this. I mean, this is really rare. The only thing they haven’t done as well as I would like is to tell the beautiful simplicity of this story. Clean. Cheap. Simple – and most of all – FAST. This will be the lowest cost and most abundant lithium source in the world – well inside five years – in an industry that should run for 50. It’s right at home in the USA, and has a Big Partner funding it. So can they raise this money to get them to capex? Juniors generally need a bull market in their commodity to raise funds, and the lithium price has come down from $20,000 per tonne to $12,000 – and stayed there. In 2017, these junior lithium stocks had huge runs, making investors a lot of money. I made a big schwack on Lithium X (40 cents to $2.50 in months) and here at Standard Lithium (75 cents to $2.80 in months). But in February 2018, US brokerage firm Morgan Stanley came out with what turned out to be a stock-killing report, saying the lithium market would be oversupplied and #1 world producer Albemarle was a short. Basically, the equity window for junior lithium stories shut soon after that. Raising funds for lithium juniors remains very challenged to this day – unless you have something very special. I think Standard Lithium has something not only special, but unique. Their process is unique – and it’s simple. You put the lithium in an agitating vat for an hour with a ceramic adsorbent and they have found the “thing” that attracts & separates out the lithium. Their relationship with Lanxess, or any big major, is unique. Their ability to scale up to large production volumes very quickly is unique. M&R were recruited/seduced away from their previous gig by SLL Chairman and large shareholder Bob Cross. Bob is chairman of B2 Gold (BTO-TSX), and was Chairman of Northern Orion, one of the most profitable copper plays of the 2000s. He was a top investment banker at brokerage firm Gordon Capital before that, when they were the power boutique on the Street. In other words, he knows how to read a market and raise money. Note that the stock is just trying to break through its 200 day moving average. I’m long, and I’m excited to watch this move forward. Clean. Cheap. Fast. The new lithium that I think makes all the other juniors obsolete, and introduces some real competition into Albemarle and SQM. And it’s just over $1/share.